There is little sense in trying to find stocks that will not be vulnerable in a situation where 87% of the market is trending down and India is getting set for a crucial election, says Devangshu Datta. A total of about 1,393 National Stock Exchange-listed stocks were traded on both February 14, 2018, and February 14, 2019. Out of these, 1,218 stocks, or 87% of the sample, were trading lower in February 2019, year on year. About 25% of those stocks were at six-year lows, trading below their 2014 prices. This is a classic bear market signal and it's backed up by the returns from most of the stock indices. Year-on-year, the NSE Smallcap 100 is down 32%, the NSE Midcap 100 is down 19% and the Nifty Next 50 is down 14%. But the major market indices, the Nifty and the Sensex, are trading within 10% of their all-time highs, which they hit in 2018. There are negative signals there as well, however. The Nifty 50 is up 2.4%, year-on-year. But just 17 stocks out of 50 have seen capital gains, year on year -- the weighted nature of the Nifty has kept it out of the red. But the returns from a Nifty ETF would be half that from a vanilla fixed deposit! This lack of breadth is a bad signal. Big stocks with strong institutional support have more resources to ride out bad times. But in a bear market this broad, the big stocks are likely to slide before smaller stocks start recovering. Sometimes a bear market presents an obvious opportunity. If the fundamentals are strong, bearish prices create attractive low valuations. But the fundamentals are not looking particularly strong either at the moment. Earnings growth is tepid even among the big stocks. The Nifty's weighted earnings per share (EPS) has fallen from 413 in February 2018 to 405 in February 2019. The current price-to-earnings (PE) multiple is 26 plus. Coupled to a negative growth rate, this looks ridiculous. One reason to hope for a bounce in the stock market is that the Reserve Bank of India has made a policy interest rates cut and, given falling inflation, there may be more rate cuts. But policy rate cuts are unlikely to translate into substantially lower commercial interest rates. The quantum of government borrowings is too large and banks and non-banking financial companies are suffering from huge non-performing asset (NPA) overhangs. A low-inflation, high-interest rate scenario can create serious problems for highly-indebted companies. A lot of Indian companies including entire sectors such as telecom and steel, are highly indebted. Debt servicing is easier when there's high nominal growth in revenues and profits. In a low inflation scenario generating high nominal profits and revenues is a problem. Most economists are also estimating a slowdown in global growth in 2019 and that will affect Indian corporates. For a stock picker, this is a difficult phase. The big blue chips are over-valued. Smaller stocks could slide further before they bottom. But defensive measures are not likely to work very well. There is little sense in trying to find stocks that will not be vulnerable in a situation where 87% of the market is trending down and India is getting set for a crucial election. The most beaten-down segment is the small caps. Small caps have been known to see 60% to 70% reactions off their highs before hitting bottom. So there is still a downside. 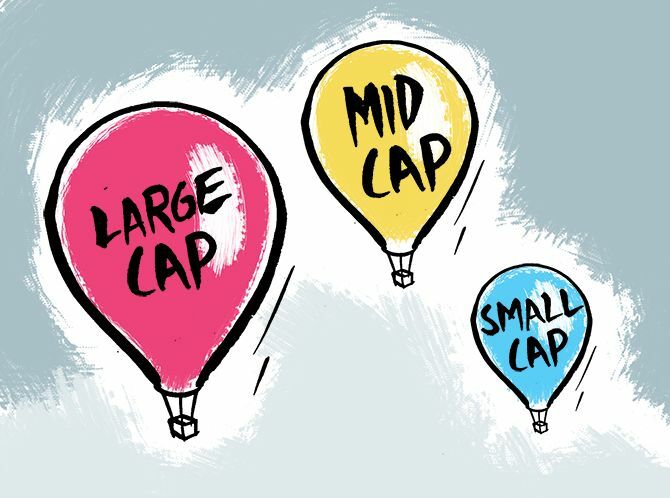 But small caps are also the segment most likely to give excess returns as and when the market turns around. That may be six months down the line, or it could be a year. In historical terms, good small cap funds tend to give excellent five year returns -five-year returns of over 20% compounded are quite common. Small cap funds also give decent three-year returns, with reasonable consistency. But there can easily be a 20% to 30% drawdown in any given year. A shotgun approach to small caps may be a good strategy. Say, you pick three small cap funds with decent three-year records and low portfolio overlaps. Invest in these systematically and continue investing, regardless of any market turmoil. Be prepared to see big drawdowns during the elections and maybe, even later. Stay invested for the next three to five years. This is not on the face of it, a safe strategy. It could be a stomach-churning ride. But if you can stick it out for the requisite length of time, it should beat most large cap portfolios comfortably.